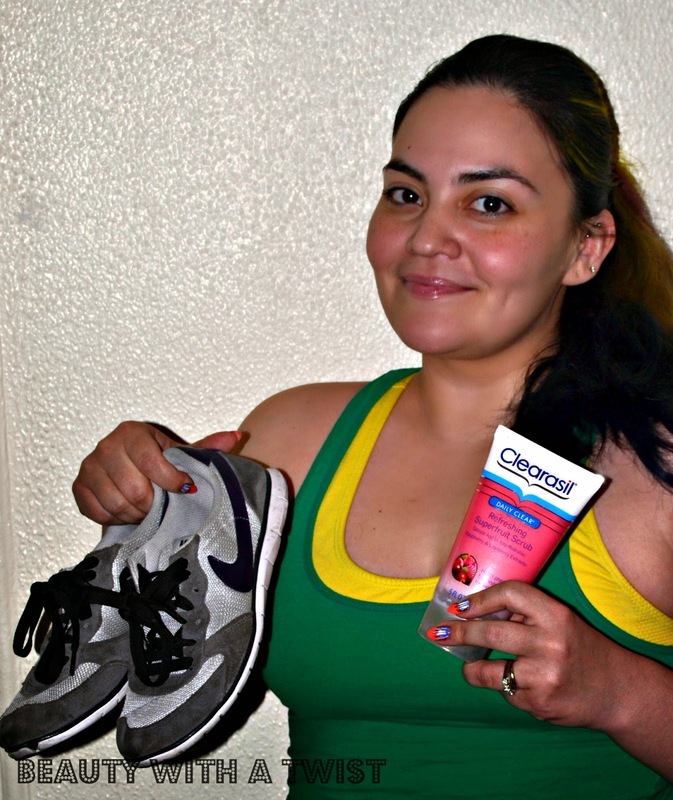 Beauty with a Twist: How I #WinTheDay! Today I've got something a little different for you, me WITHOUT makeup! I know this is a beauty blog and all but can I tell you guys a secret? If I'm not working or doing something important, then I am most likely not wearing anything except moisturizer. I do it to let my skin breathe (and laziness, haha). I also try to be really good about skincare, including cleansing and exfoliating. So when Refinery 29 + Clearasil asked to share how I "Win The Day" along with trying out their Daily Cleanse Refreshing Superfruit Scrub, I couldn't say no! But first, let's talk about how I #WinTheDay... For a while now, I have been feeling stressed and angsty, along with not being able to sleep. I knew I needed to DO something about it. And so I did... What's helped make a big difference for me, has been going to the gym. I make sure to go a few times a week, and just work out all the stress! I go straight after work, and I honestly feel so much better when I'm done. Which is why you see me posing with my sneakers, haha. I'm lucky that I've always had pretty good skin, not oily or dry. I barely break out, even when I was a teenager (feels like such a long time ago!) So I do my part to keep my skin looking great! I always try to exfoliate my skin a few times a week, and I love trying out new products. I remember using Clearasil scrubs in the past and was curious to see how this product would work. The Refreshing Superfruit Scrub smells super yummy (it's got raspberry and cranberry extracts, along with Vitamin B3), contains 1% Salicyclic Acid (great for treating AND preventing break outs), and is gentle enough to use everyday. I love how it isn't super abrasive, and it doesn't give my skin that tight feeling. Oh, and it leaves your skin CRAZY soft! I definitely recommend this product if you're looking for: a gentle scrub, something that treats acne without being excessively drying, and is affordable as well. So how do you #WinTheDay? I wanna know! *While I received these items for review along with compensation, it in no way affects my opinion. For more information please check out my disclosure policy. 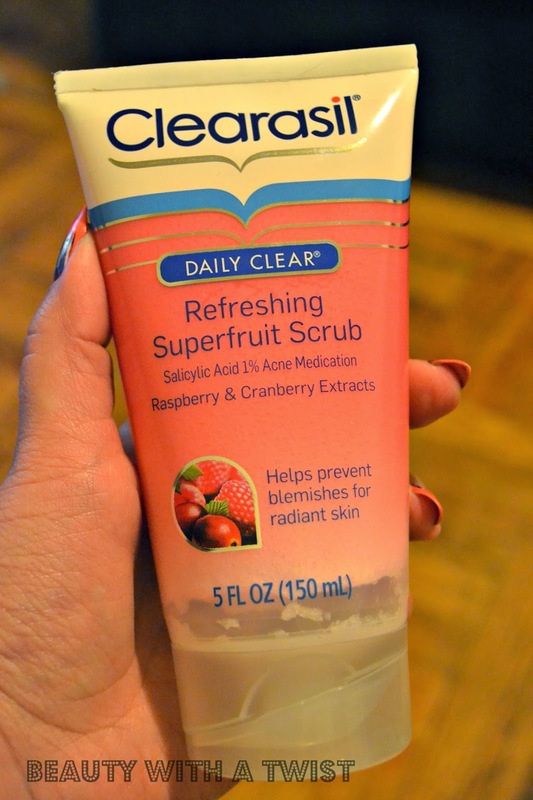 I love fruit scrubs, and Clearasil has always been a part of my life :) Will definitely check this scrub out!